It's not often shoes get me teary, but these beauties really did leave me feeling all emotional when I opened the box. No, I don't remember what time of the month it was. I gave them their first outing at the weekend and, after a whole day of wandering, my feet remained unscathed and blister free thanks to all the lovely cushioning inside. I have thus come to conclude what I've always (not so) secretly suspected: Senso are shoe gods. You can also find this particular pair on ASOS here. In other news, my new YouTube video is finally live, and this time round it's the YouTuber Confessions tag. Black and white is perfection. I LOVE THESE SHOES. There's something a bit cowboy about them, but they're totally cool. COOL COWBOY. I'm massively rating the whole tailored, chic look you've got going on here. Love the layering on this. Androgynous perfection! I love how these shoes are business at the front - party at the back. love them. Oooh my freakin' gosh. Those Senso boots are ridonkulous. I looove this brand (from afar). I have to say I really like these shoes! They're not at all my style and pretty edgy for me but I love the way you paired them with this otherwise polished outfit! Awesome look. 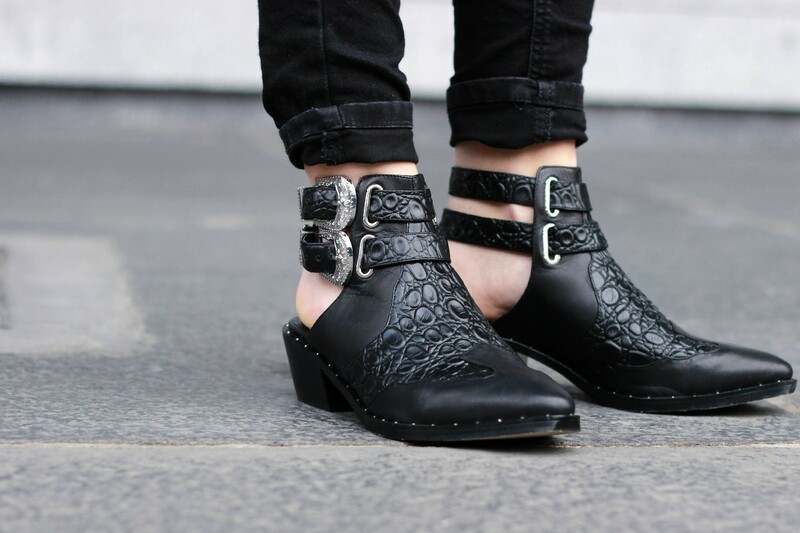 Oooh Senso shoes have been on my list for some time, after hearing how comfortable you found them I might have to give them a whirl! Great layering in these pics too btw, fantastic use of the crop! this is very cool look!! I love styling crop tops with shirts and the shoes OMG they´re so cool! This outfit is absolutely great! Love this outfit :) so simple but looks really chic on you! And those shoes are amazing. Ahh I love this outfit, those shoes are crazy incredible!! Love how you layered the shirt and jumper also. As usual, a truly perfect outfit - loving it!! LOVE! LOVE! LOVE! The boots! Probably the most amazing boots I have EVER seen.